This Bottle of Hope has been posted on my Flickr account for a while, so many of you have already seen it. It's a pink ninja, made for a local cancer survivor named Cindy who helped get my guild started in the Bottles of Hope (BOH) program. Pink ninjas were Cindy's personal symbol of strength through her cancer treatments, so I made this bottle to thank her for her help and for speaking to our guild. The sculpture itself was a bit out of my comfort zone. I'm no ninja expert, so I had to do a fair bit of research on what makes up a ninja. Sculpting people & making clothes are all new to me, too — not to mention doing these things around a bottle form. It was definitely a learning process. I was really relieved when I gave the bottle to Cindy and she seemed to like it. But I was especially thrilled when I saw that she liked it enough to use it as the photo for her Pink Ninja Race for the Cure team page. I do believe this is the first time a creation of mine has been used as a team mascot. I'm so proud! One month from now, I'll be joining the Pink Ninja team as they take part in the 2008 Susan G. Komen Race for the Cure. (I'm planning on just walking the 5K this time instead of running it... ya know, being pregnant and all!) If preventing and treating breast cancer is a cause that is important to you, I would truly appreciate your support in helping me reach my personal fundraising goal. Thanks so much — and GO Pink Ninjas! 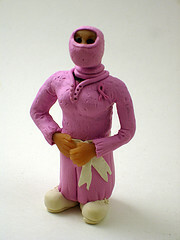 Presenting my pink ninja, now "famous" as a polymer clay mascot, plus info on how to donate to the Komen Race for the Cure.